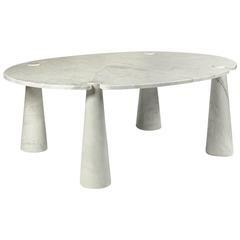 Marble dining table by Angelo Mangiarotti. Pedestal base with round Carrara marble top. A vintage marble Angelo Mangiarotti double pedestal black marble table. It is very rare to find a double pedestal in this size and condition. Made sometime between the 1960s-1970s. Circular top fitted in four conic legs. Marble Carrara. "Eros" collection. Skipper editions.